Leave M40 at Junction 8 for Oxford. At the first roundabout turn left on to A4142. Follow the ring road until the Hinksey Hill interchange (with exit for A34 to Wootton). Follow the sign for Wootton/Youlbury Scout Camp. At Youlbury Scout Camp turn right and drive for about 300 yards to the Carmelite Priory. Leave A34 at the exit for Wootton/Youlbury Scout Camp. Follow the signs for Wootton/Youlbury Scout Camp. There is an excellent train and bus service to Oxford from anywhere in the UK. However, there is a very limited local bus service to Boars Hill. If you choose to take this route, please allow ample time. The bus journey takes about 26 minutes and the walk to the priory takes about 35 minutes. If you wish to take taxi from the train or bus station, we have a special arrangement with Royal Cars. Pre-booking is necessary on 01865 777 333. Youlbury Scout Camp is a good landmark for taxi drivers. 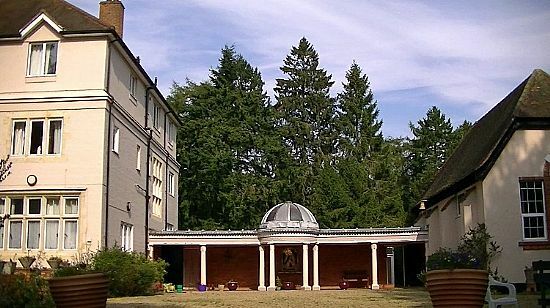 The Carmelite Priory is just 300 yards past the main entrance to the camp.